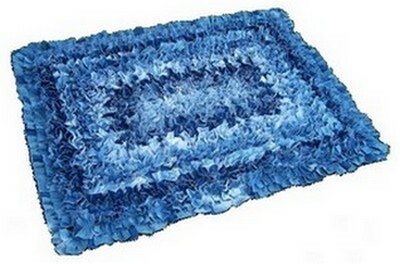 Here’s a denim rug recycled from a variety of thinner denim fabrics, such as those used for shirts or skirts. Joyce, the designer, drew inspiration from her Grandma B’s hand-made scatter rugs, usually made with non-fraying double-knits. Although the denim version does fray, especially after washing, the homespun look that results has an appeal all its own. 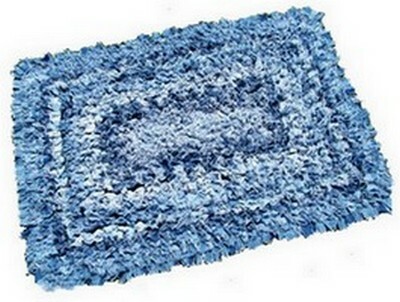 Joyce’s denim rug is shown in two views, the first, after completion, and secondly, after washing and drying. Two jumpers, one dress, a pair of denim slacks, a work shirt and old denim skirt were all used in the construction. If you’d like to make your own, you’ll need lots of denim to cut up into small rectangles, plus a larger section of thicker denim (pieced together to get the size you need, if necessary), as the backing. 2. Mark the backing fabric with dressmaker’s pencil or something similar. Start at the outside edge and draw lines one inch apart. In the sample shown, the lines were drawn in decreasing rectangles, but straight lines would work too. 3. Cut lots and lots of 2 by 3 inch rectangles of thin denim. 4. Starting in the center of the denim fabric, and working outwards, begin sewing the fabric rectangles to the backing fabric. Sew straight through the middle of the rectangle width, so both sides stick up evenly, gathering the fabric either before you stick the fabric under the presser foot, or bunching it up as you sew. 5. When you have completed one line, or gone around one marked rectangle, sew it down again to secure it. 6. For the last rounds, cut the rectangles in half along the length, to make rectangles that are 1½ inches by 2 inches, and sew along the edge of the backing fabric, so that the last row lies flat. Grandma B’s original double-knit scatter rugs were non-fraying and virtually indestructible, so if you have unwearables made from double-knit, velour, or other non-fraying fabrics, consider recycling them into a bright rug of your own. The colorful rug shown here, at right, was made from scraps of velour. Joyce is married to a handsome farmer, and has three children. She writes an engaging blog, called The Funky Clothespin, where she hangs out thoughts, anecdotes, and whimsical family happenings for your perusal. Thoroughly enjoyable! I’m a little confused. How are you turning the rectangles into bow ties without wrinkling the back? Love the rug ! I haven’t made the rug, but I have sewn similar things and made a lot of ruffles. If you look at Step 4, she does explain the method, although I can see why you’re wondering why the back doesn’t pucker as you sew. I think the answer lies in using a heavy-duty denim or heavier weight backing fabric than the lightweight denim used for the rectangles. The process of puckering or ruffling is done to each rectangle before going under the presser foot or as you are feeding it through. Might be a bit awkward at first, but I think you’d soon get a feel for it. Good luck if you try it! I have a lot of old jeans that r not wearable, what could u suggest I could make with them? Hi, just found your denim rug! Can you make it out of blue jeans as long as you use a jean needle? Wish I had my Small Singer Featherlite (inshop)it would sew through anything! I don’t think I have enough denim clothes or thinner bluejeans. Guess I could go to Goodwill and find some maybe. We have snow in the Winters here in Colorado and this would work by my front door for snowy wet boots. Thank you for such good instructions. Hi, Lynda, I haven’t heard from anyone yet who has tried this with regular weight denim. You’re right, a jean needle would make it easier, and I, too, have had favorite machines in the past that would cope with anything. We also have wicked winters here and thicker denim would certainly be useful to deal with snow. If you do try this, please let me know how you get on; I’m sure there are other people who are wondering about this as well. What is the size of that rug? I just found a huge, AND I MEAN HUGE…..bag of Double knit, clothes. Most of it will be used for rugs…. Buttttt…lol…I found a nice pile, I’m keeping to wear! Well, now you’ve got me curious. I’d love to see what you make. And what you end up wearing! Wish you showed step by step pictures or a video. Never done anything like this and would love to try. I haven’t made this yet either, but I’d love to try too. If I find time this fall, I’ll try to take step-by-step photos to add to this tutorial.